Time to BAKE the Doughnuts! Whether you are celebrating Fat Tuesday, National Doughnut Day or just need a fun, tasty dessert or snack, this lesson brings you some healthy ideas for incorporating this usually unhealthy treat into your class. Continue reading for some historical background on these mini-pastries, along with how they are commercially made and then bake up some sweetness by preparing a healthy version of the baked vanilla doughnut. And don’t forget the healthy topping too! Raise your hand if you like doughnuts. Why? What is it about them that you like? Which flavor is your favorite? (Create a list on the board and have students rank their favorites—tally them individually.) Did you know that the most popular doughnut flavor in America is the Glazed doughnut? How does that compare to our class list of most favorites? What is your favorite way to eat them? What do you like to drink while eating a doughnut? Where is your favorite place to buy them? Where did they come from? Who invented them? 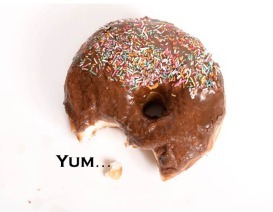 Today….is your lucky day as we are going to find out more about the history of doughnuts! To learn more about the history of doughnuts go to this website and use it to complete the “History of Doughnuts” questions. Ask if anyone knows how commercial doughnuts are made? Find out by viewing this Donuts How It’s Made Minisode. As you can see there are different types of doughnuts; yeast and cake. The video shows them frying the doughnuts, which is not so healthy considering all of the fat. So is there a quicker, healthier way to make doughnuts? Sure…we can bake them in the oven and prepare them with chemical leavening agents instead of yeast. We can use one of two methods to bake them. 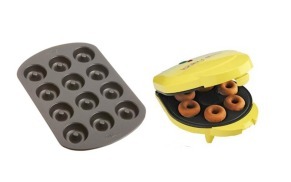 One is the mini doughnut pan and the other the mini doughnut maker. I use the pans, but my daughter has the maker so I show students both of them. Discuss the pros and cons of each. For example, storage, cost, time, ease of use, energy efficiency, amount each can make per single use, etc. Prepare and serve mini baked doughnuts to taste test. Each kitchen makes the basic Vanilla with a different healthy topping via Parade Magazine. Just be aware…baking times may need to be adjusted if making the mini versions. Did You Know Donut Trivia Facts Bulletin Board:Give each student a donut template (enlarge to desired size) in a fun color and ask them to locate trivia facts about donuts. They are to write the fact on the donut and then staple it to bulletin board when finished and voila`….instant display that will surely attract viewers! Template is included in the lesson below.